We have had some recent new additions to We’re Duck ‘N’ Chicks. Some new ducklings. Who doesn’t think these little guys are cute? Daughter and Son really wanted new ducklings, especially after the loss of Daughter’s special chicken, Lavender, who died last week. (That will be in an upcoming post.) So since I aim to please (and distract) I went on a wild goose chase….excuse the fowl language. That took us to a feed store miles away from home on the search. My Garmin took me out to the middle of no where, which was ok because the kids got to see a baby calf just born trying to stand and walk. Further out in the field there was another cow giving birth, or trying to. I knew which direction I was headed, sorta, so I drove until I found town. It was easy. We found the Safeway, used the wifi so I could find the address on my Kindle, since Garmin was failing me. 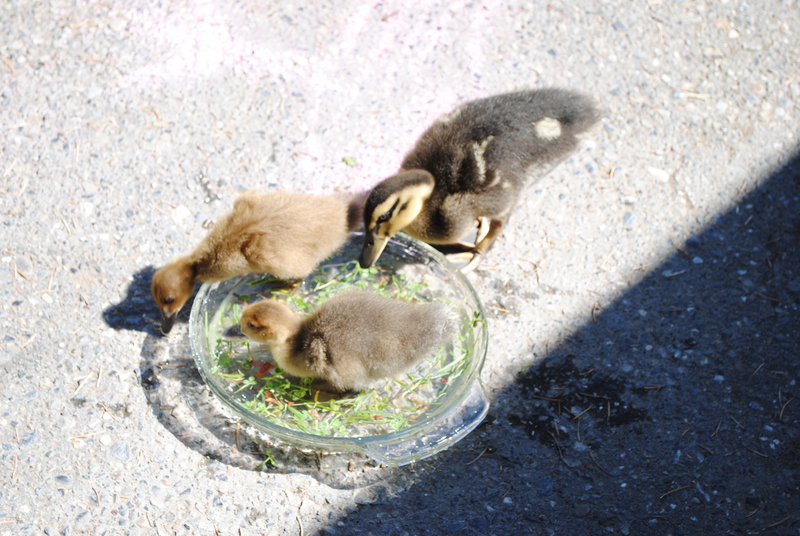 We found the feed store and asked where the ducklings were. The lady working wasn’t the friendliest. If I wasn’t in such a desperate need to point their focus in a new direction, I would have left and gone somewhere else. But, my babies had already picked some out. Daughter chose a Muscovy and Son chose a Rouen. The Muscovy is the little brown duckling with the yellow chest and the Rouen is the large one with dark brown and stripes. Later that day, I was able to get a hold of the place where I’ve gotten all of my ducks and chicks from to get another Khaki Campbell. She is the all brown one. The Three Duck-ateers provide us with so much fun! We put them into the bath tub to let them swim around and Antonio (Rouen) swims under the water as fast as he can! I have never had any of our Khakis do that. During the day we’ve been taking them out to enjoy the nice warm sunshine that is so rarely seen in WA, especially this time of year! We spoil them with Weed Soup and they dig that! They also love to chase the ants in our driveway or jump into the air to catch a passing moth. Soon, we will be incubating our own ducklings! We can’t wait for that! !